Prosecco in the Park: is everyone hanging out without me? This week has been busy and long. My aunt has been in town visiting so we have been all over, everywhere from East Hampton to SoHo. It’s been simultaneously fun and exhausting. I did however get to finish Mindy’s book. We’re on a first name basis now. And as she accurately predicted, it only took two days once I actually got started. I did that weird thing again, where I really liked the tiny bit I read when I flipped the page open and magically landed on an Amy Poehler story, and didn’t want to start reading so that I wouldn’t have to finish. I really liked this book. I didn’t love it like I loved Bossypants, but I loved hearing about Mindy’s life and career and how much she loves all of the people I love. Did I use the word love enough in that sentence? I’m trying to hit a quota. We also appear to have a good amount in common. For instance, I read part of the chapter about dating out loud to JD because I was pretty sure that I have had that exact conversation with a friend before. He confirmed. I am not a good person to discuss things like that with because like Mindy, I ask too many questions and will point out all of the times you could have been murdered. I also find it interesting that people think of her as being the same person as her Office character Kelly Kapoor, which she is clearly not. All in all, I very much enjoyed this book. It’s told in Mindy’s voice, so you can pretty much hear her telling the story as you read. It was quick and entertaining, I laughed out loud every other page, and didn’t want to put it down. It’s definitely the kind of book that would be perfect to read on a flight or at the beach. Have you read Is Everyone Hanging Out Without Me? What did you think? Let me know! wow, i think im loving this book already, will check this book out now. Sounds like a great book! I definitely want to look into it! I totally want to read this book! Thank you for reminding me! Downloading it as soon as I get home so I have something to read this weekend! I love her so I definitely have to check it out! I didnt know she had a book! Sounds like fun! ill have to try it out! i have been wanting to read this! looks like a fun, easy read! 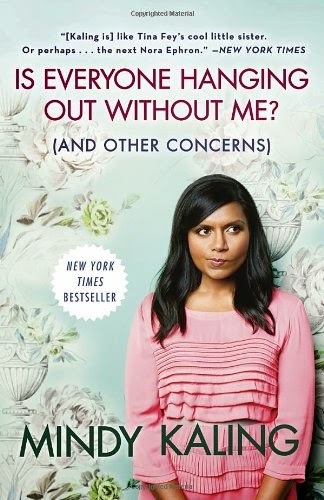 I love Mindy, going to have to check this out! Thanks for sharing this. I read the reviews, looks like a fun book to check out. This is great, sounds like something I'd enjoy. I haven't read it, but I've had a few recommendations, so I think I'll read it soon. I'm reading it right now. I really like it. I haven't read Bossypants so I can't compare it to that. I'm obsessed with "The Mindy Project" though so it is fun to learn more about Mindy and her background. Putting this on my reading list ASAP! Hope you had a lovely weekend. it's awesome to have some hilarious women reppin! I definitely will buy it!